We all want to believe that all dogs are friendly and obedient, but unfortunately there are dogs that are hostile, aggressive, and dangerous. Though many people think that aggression in dogs is mostly breed-specific and can also be improved by behavioral training, it is not as simple as that. Dog aggression can be a result of a lot of other causes - sometimes the owner is the cause! If you have an aggressive dog, of course proper training is necessary. At the same time, you may also want to manage the aggression holistically by using natural remedies such as herbs and essential oils. Read on and find out more! Dogs that are sick or are in pain tend to turn aggressive. 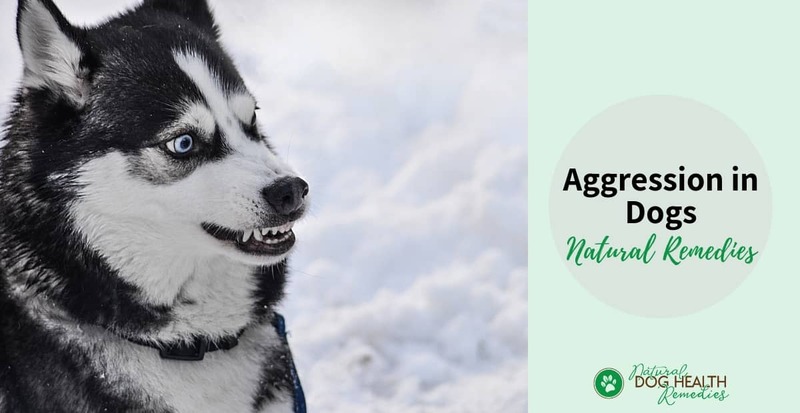 If your dog suddenly becomes aggressive and growls or snaps at you especially while being touched, it may be because he is suffering from some kind of dog disease that is causing him pain. There are of course a lot of possible physical pain-causing issues that can turn a calm dog into an aggressive one. For example, injury, oral problems, ear infections, joint pain and arthritis, and more. Autoimmune Thyroiditis: This autoimmune disease is a genetic defect that causes inflammation of the thyroid gland. Autoimmune thyroiditis can result in aggressive behavior in dogs. Encephalitis: This is an inflammation of the brain that can be caused by diseases such as distemper or rabies, and can result in aggressive or fearful behavior in dogs, depending on the location of the infection. Hypoglycemia: Low blood sugar level in dogs may cause them to become snappy, anxious and fearful. Brain Tumors: Brain tumors may lead to aggression in some dogs. In addition, they may cause a dog to show symptoms such as irritability, confusion, barking incessantly, whining, etc. Head Injury: Trauma to the head due to an accident may result in internal bleeding and swelling. This can interfere with normal brain function and, as a result, the dog may show abnormal behavior such as aggression. Older dogs may become more aggressive because they have more aches and pains in their bodies. Also their hearing is getting poorer and they can be startled easily. Being aggressive in this case is a way of self-protection. Senior dogs with cognitive dysfunction may fail to recognize their own family members and friends, and may display aggressive behavior as a result. Male dogs in heat can also show aggression toward other male dogs. Female dogs with puppies may show what is called "maternal aggression" toward anyone that approaches their puppies. 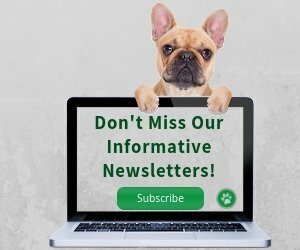 If a dog is on a poor-quality diet, he may become aggressive because he is not getting the proper nutrition for his brain to function properly. Undersocialized puppies and those who have had traumatic or fearful experiences during socialization period are more likely to develop fear- and aggression-related behavioral problems when they become adults. Dogs that have been abused, punished excessively, or neglected in the past also tend to be aggressive. For example, a dog that is always confined and whose owner uses severe punishment can become fearful. Fear in turn can cause aggressive behavior in the dog. In fact, studies have proved that socially confrontational and harsh training methods (think "alpha rolls, "scruff shaking", etc.) as well as physical punishment are associated with aggressive responses in dogs. Sometimes, overly-active children with unpredictable behavior toward the dog may also trigger aggressive responses in the dog. As well, improper training and inconsistent leadership can lead to dominance-related aggression in dogs. These dogs are always confused about the human-dog relationship and are constantly in a state of insecurity. They do not know who the "pack leader" is and therefore have to be aggressive for self-protection. Usually, the aggressive acts are directed toward one or several family members whom the dog regarded as "low-ranking" members in the pack. Some people may say "breed" is also a contributing factor, and some dog breeds are particularly "problematic". However, an article by Applied Animal Behavior suggests that aggression in dogs is more the result of the dog's owner and upbringing, rather than the dog's breed. The study showed that no form of aggressive behavior (e.g. barking, lunging, growling, biting) was exclusively breed-specific. Chasing people or threatening to bite. If your dog sudddenly turns aggressive, especially if he starts snarling or growling at you while you are trying to pet or groom him, take him to the vet for a check-up. As mentioned above, his aggression may be due to pain caused by some sort of physical problems. If you have a dog that shows signs of aggression, you should make sure that you are feeding him food that is nutritive and wholesome. Switch to a natural, high-quality pet food if you have not already done so. Or better yet, feed him organic, home-made food, with natural supplements added. Sometimes dogs with behavioral problems have too much energy and they also want some badly needed human attention. Regular daily physical exercise and stimulating play time may be helpful in consuming extra cooped-up energy, making them tired and happily content. It is advisable to start a training program with a professional animal behaviorist - for both your dog and you! The behaviorist can help you and your dog define your respective positions as leader-protector (that is you!) and safe-subordinate pack member (your dog). Making your dog realize his position can eliminate his aggression caused by fear and insecurity. Many natural remedies, such as herbs, supplements, and essential oils, can calm down an excitable and aggressive dog. These remedies can be used to take the edge off your dog's anger, making him more mellow and secure. The remedies can be used in conjunction with other treatments mentioned above. 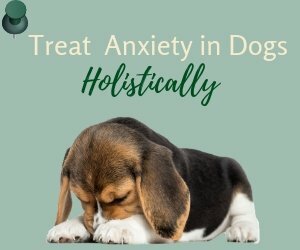 Calming herbs are effective in relaxing an aggressive dog. Try using chamomile or lemon balm. These herbs can lift your dog's mood and make him happier and more secure. Holy Basil (Tulsi) is another herb that may help. It is an adaptogenic herb and can help the dog's body to respond better to stress. Alternative, try the herb Ashwagandha, which is also an adaptogen and has similar functions as Holy Basil. Vitamin B6: This vitamin helps with the production of serotonin, a neurotransmitter that regulates mood and anxiety, and supports a healthy nervous system. Gamma-Aminobutyric Acid (GABA): GABA is an amino acid that serves as a neurotransmitter. Deficiency of GABA can result in anxiety and panic attacks. 5-Hydroxytrytophan (5-HTP): 5-HTP is the precursor to serotonin and supplementation of 5-HTP is a simple and direct way to increase brain serotonin. When levels of serotonin are too low, the result can be fear, aggression and anxiety. 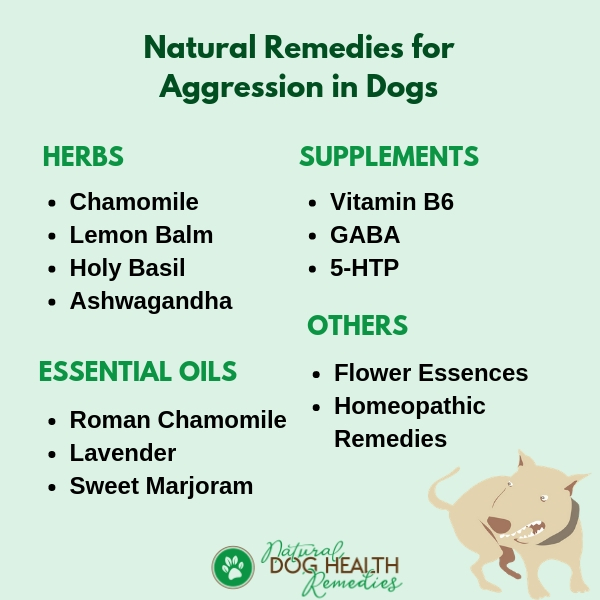 If your dog is showing aggressive behavior, be sure to discuss with a holistic vet to see if any of the above supplements are appropriate for your dog. 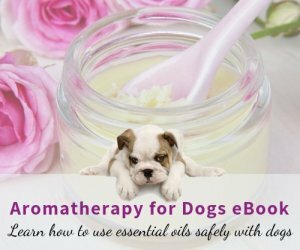 You may also want to use the following essential oils to make a blend to calm down your dog. Put 4 to 5 drops of the blend on a bandanna and tie it around your dog's neck. The scent will stay active for around 4 to 5 hours. Repeat once daily until you see an improvement in the dog's behavior. If your dog lets you, you can also use this blend topically on your dog. Rub a few drops of the essential oil blend between your hands and apply it on the edge of your dog's ears, between the toes, on his inner thighs, or under his "armpits". Some dog parents have found that using flower essences could help calm down their out-of-control aggressive dogs. Flower essences are very safe and are quite effective for emotional problems such as aggression, frustration, etc. This product uses a unique combination of specially selected herbal and homeopathic ingredients. These ingredients are known for their calming effects. The product may help to aggression levels in nervous or frustrated dogs. If you have an aggressive dog with unpredictable behavior, it is advisable to keep him on a leash at all times, even at home. The leash allows you to have safer and better control over your dog. Also consider using a muzzle on your dog (especially when going outside or when you have company). Until you receive professional help, avoid all interactions that trigger your dog's aggression. Even if your dog acts aggressively toward you or other family members, do not use physical punishment as this can only aggravate his aggressive behavior. Keep your dog confined in a separate room (especially when you have company or children are present). Remove all objects (such as bones or toys) that your dog may be guarding.